How to Style Your Dresser. Styling your bedroom dresser is a matter of preference of course but, it is also a lot like styling your mantle. In fact, it’s styling retail space you just have to take advantage of. 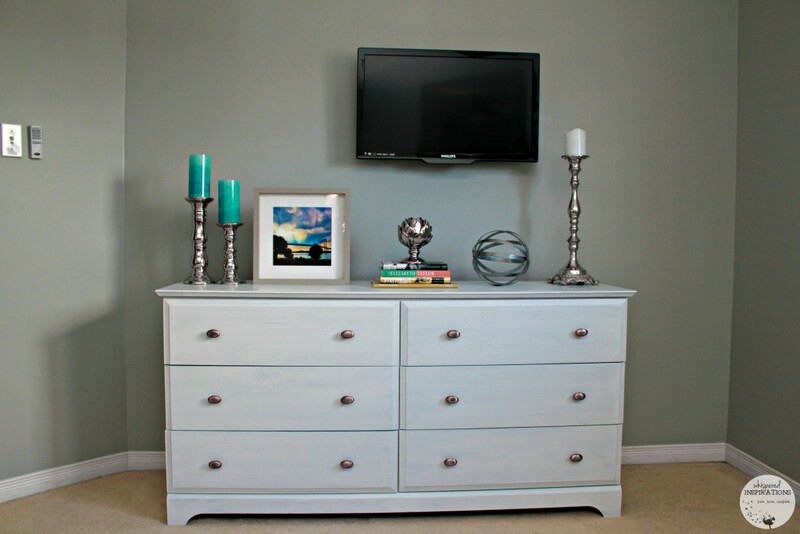 It depends on the style of your dresser as well but, it is generally the same idea for all types. You will be surprised at how much a few key pieces can do to a space and how you can bring it to life easily. If you have a wide one like I do–you can use these steps! If not, you can play around with the same concept, just vary in the heights used. For both ends of the dresser, I picked a few candle sticks to give the dresser height. 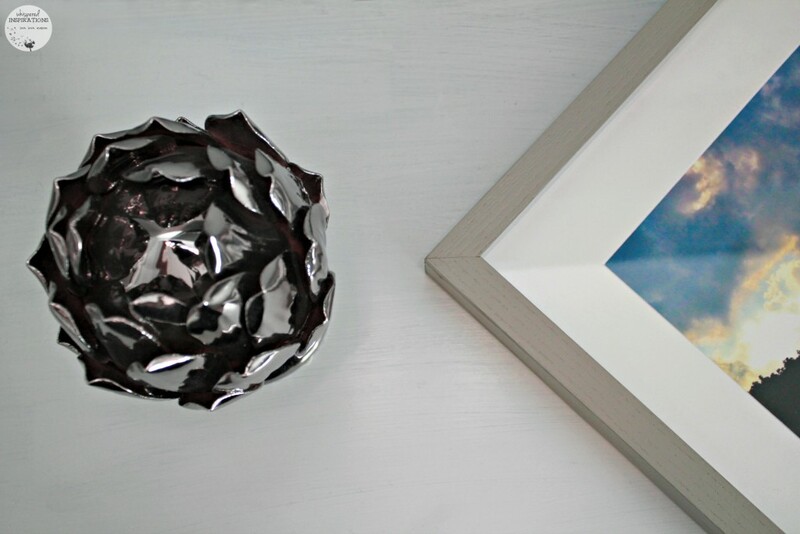 I chose silver to create contrast against the dresser and the walls. I chose colorful candles to provide a pop of color. Place the candle sticks on both ends of the dresser and you’ll be good to go! I also chose a white electric candle to light as well. I added a decorative orb to balance it out and fill in the empty space. 2. Bring In the Books. One of my favorite styling items are books. Not only do I love reading them, I love the color and character they can add to any space. I choose ones that are interesting and it totally doesn’t hurt that they are pretty and colorful too. All you have to do is stack them up and choose a decorative piece or candle holder to adorn the top. Instant level and color dimension. I used a silver lotus flower to finish my book styling. 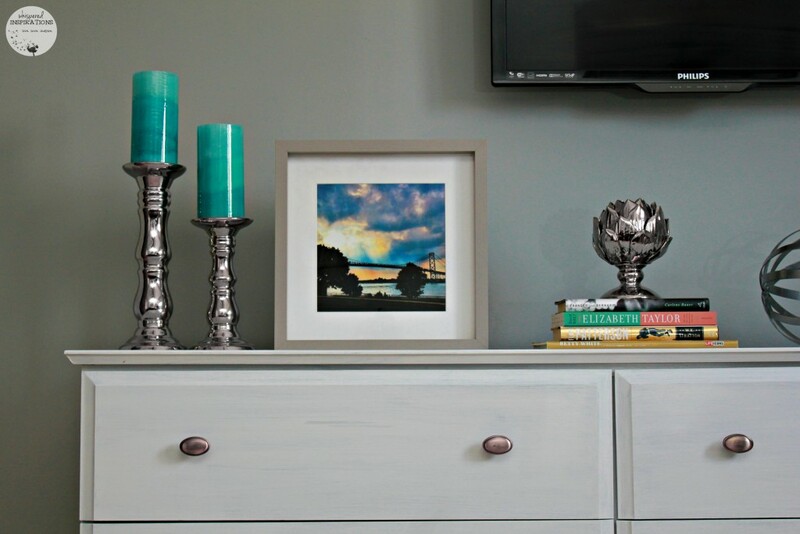 Choose a piece of art that is the focal point of the dresser. I decided to choose a loft frame from Posterjack. Inspired by contemporary design and living spaces, the Loft Frame is a Posterjack-exclusive that is designed and made in Canada. It is 1.5-inches deep, the solid wood frame is defined by its deep-set mounting. The image is recessed one inch from the face of the frame. Needless to say, it is fabulous and comes in Onyx Black, Crisp White and Dove Grey. I chose to stand it instead of hanging it. It is wide and sturdy enough to stand on its own without fear of tipping. Of course, these frames are great for hanging too. Our city isn’t big by any means. We don’t have tall skyscrapers or a subway but, it isn’t small either. But simply put, it is home. I’ve been here almost all of my life and it is the second city we moved to after we came to Canada from our homeland. I classify myself as a border city girl and it is one of the things that I love the most about it. In less than a half hour, I can be in the US or on a plane to another part of the world! In November, we had a very, very mild start to winter. In fact, there were some days in November that we were outside in just shirts, no coats. On one of these particular days, we took to our waterfront to watch the sunset. The result was this image and it’s incredible. I think it sums up the beauty of both countries and what connects us! 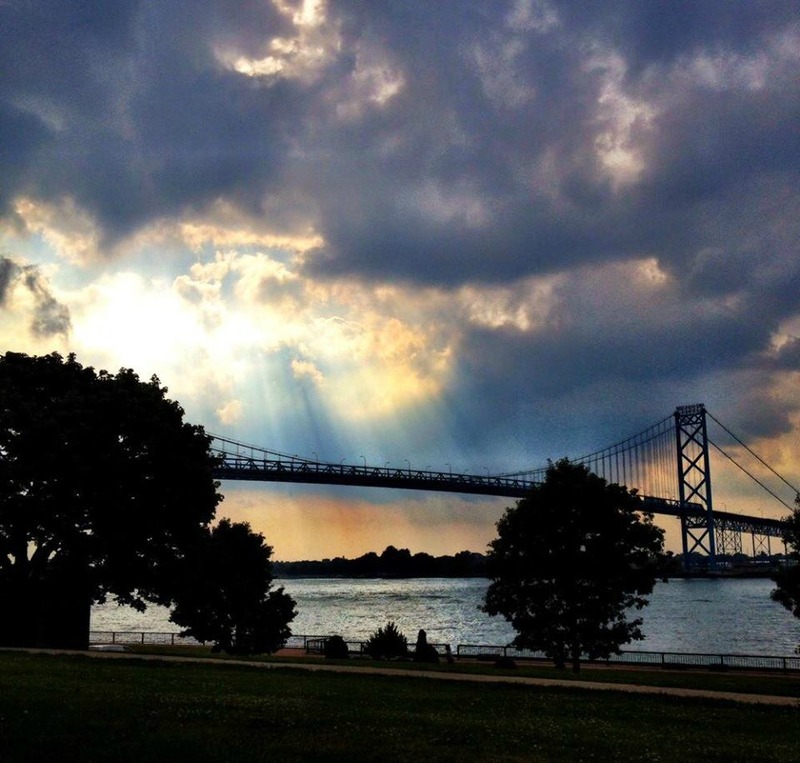 I love being a border city girl and my US neighbors, in fact, Michigan is like my second home. Now, I love that I have a piece of my city in our home. For more information about capturing your city or a moment in your life and making it into art, go to Posterjack.ca. How do you style your dresser–do you have any tips? I like the photo you chose and the way you dressed up the dresser with those few items.Very nice ! I am so jealous of your dresser set up! I would LOVE to decorate and dress up my dresser but than my girls would just take everything off and stash it somewhere lol. one day…. Kristen before you know it those kids will be adults and nothing will be moved.Enjoy them it goes to fast! 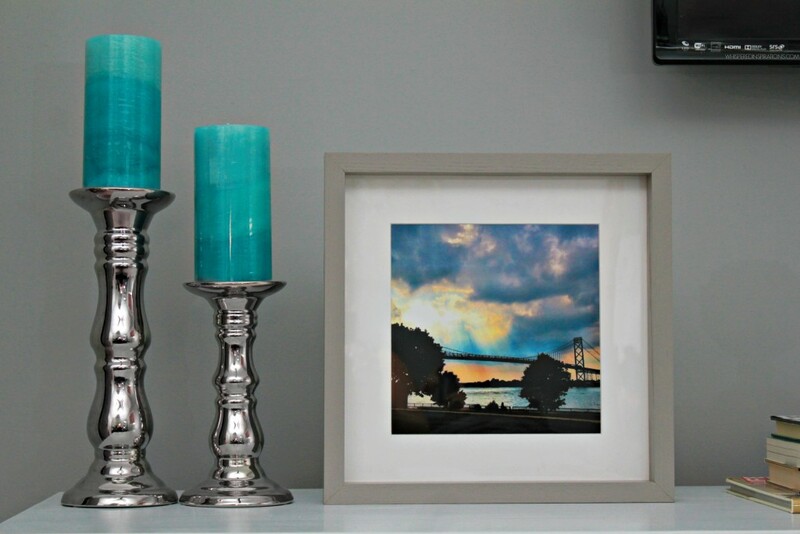 I am seriously thinking about adding a splash of deep reddish orange to my main bathroom,i think i will do a few framed photos of red skies like your framed photos.